Bryce Harper hasn’t even seen a spring training plate appearance for the Philadelphia Phillies, and he may already be paying for himself. 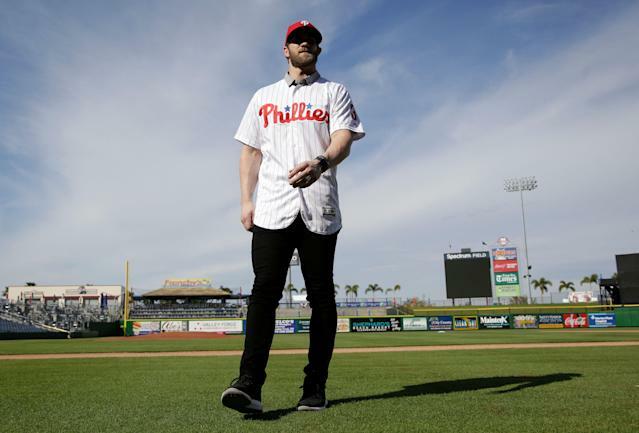 A day after he was officially introduced as the newest member of the Phillies and his jersey hit the team’s store, Harper’s jersey has broken the 24-hour sales record for a jersey launch in any sport. That data comes via Fanatics, which runs the Phillies’ online store. Overall, Harper’s introduction drove a 5,000 percent increase in sales of Phillies merchandise compared to the same day last year, per Front Office Sports. Harper’s Phillies jersey notably features a new number from the No. 34 he donned with the Washington Nationals. Since that number was worn by the late Roy Halladay in Philadelphia, Harper will instead wear No. 3 out of respect. The 26-year-old star is expected finally make his spring training debut on Saturday against the Blue Jays, per Phillies.com. In addition to buying up more Harper jerseys than ever previously seen, Phillies fans have also been hitting the team’s box office hard since it was reported that Harper was headed for Citizens Bank Park. Between when the news broke on Thursday that Harper would sign a 13-year, $330 million deal with the Phillies to early Friday morning, the team sold a whopping 100,000 tickets according to its senior vice president of ticket operations. Before the Bryce Harper news broke yesterday, the #Phillies had sold roughly 200,000 more tickets than at this same point last year. They have sold about 100,000 tickets since, #Phillies senior VP of ticket operations John Weber said. Hard to say, but it might be a 1-day record. Clearly, Phillies fans are excited to see a team that has added not just Harper, but also J.T. Realmuto, Jean Segura, Andrew McCutchen and David Robertson in a transformative offseason. Acquiring all that talent has come at a great cost, both in dollars and prospects, but it’s hard to second-guess a team when it’s now projected as an NL East favorite and making money like it has since we first learned Harper was coming to town.